1st April, Farmers grazing cattle on the steep slopes of the Malvern Hills have found some of their herd’s downward-facing legs developing joint problems. The problem had become so serious they were faced with having to remove them from the hills to protect the animals’ welfare, unless a solution could be found. The cattle are popular with visitors and also help to control invasive species. The Malvern Hills Trust approached the economic development team at Malvern Hills District Council in a bid to solve the problem. Together with local boffins, they have come to the rescue by providing bionic boots to the affected cattle, which ensure they graze on the level, no matter how steep the gradient. 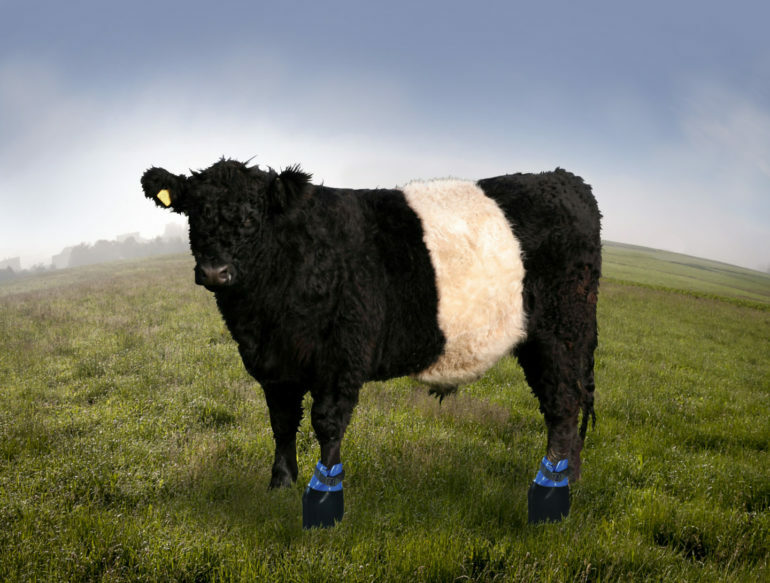 Visitors to The Malvern’s love seeing the Belted Galloway Cattle on the hills, so we really wanted to find a solution to keep them there. Thanks to Malvern’s scientific heritage, the town has been able to draw upon some of the sharpest technological and engineering minds in the UK to create the Bionic Boot.